Speaking of silly - hahahaha! UPDATE: Here are the pictures - it was so slow the other day I couldn't post the pictures at all. The dogs are still missing! (playmobil plastic dogs) It was a small 'thrift' lot from Ebay - so it doesn't have all the things in it that would normally be there. Here it is at Amazon with all the components - but it is out of stock everywhere There is a similar dollhouse that is cute, too! Update Update! Mark found the dogs in an empty diaper box today, how funny! 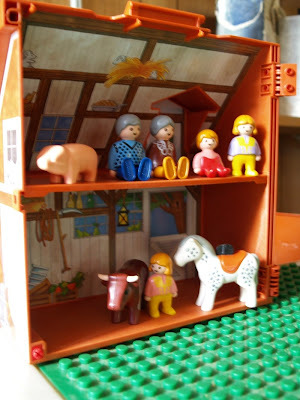 This is the Playmobil Farm we bought for Esme off of Ebay. 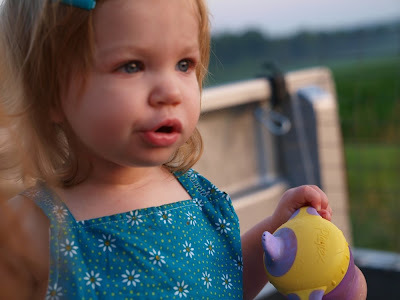 She caught on right away that the dogs and horsie and cow go running all over the place and the house opens and shuts. 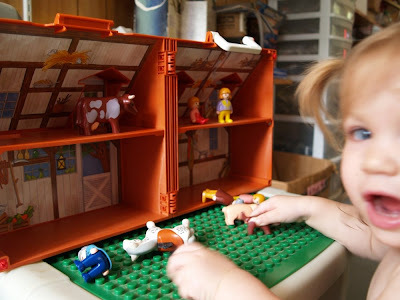 I had some cowboy and Indian Playmobil as a kid, and loved it. This is geared towards a younger child than the set I played with, which had little guns and headdresses and hats that snapped onto the cowboys and Indians. Esme has already misplaced the brown and black dogs that came with it - they are somewhere in the vicinity of my sewing machine but neither of us can find them right now! Esme got to see her grandparents today and had a rollicking good time up there. She went down for a nap almost immediately when we got home. I'm still not sure what I want to make next for crafting - more shorts for Esme would be good, but not as interesting a project as I'm looking for. She does need more - they are much cooler than the leggings even in the house with the A/C on it does get hotter upstairs. Mark showed Esme how to put on shorts this morning with an example I asked him to perform. He showed her one leg, two leg, and then pull up. She said 'WOOOOWWW, Good job!' and gave him applause. Silly kid. She also said to me over and over she was (already) 'ready' when I wanted to put her hair up. I said 'you're not ready - let me put your hair up in doggie ears' (pigtails, but she has never seen a pig so I call them doggie ears) She grabbed the brush and ran towards the stairs calling 'ready ready ready'. 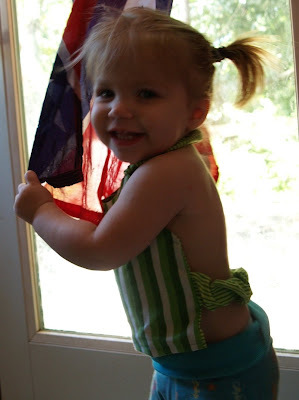 She doesn't like her hair being put up - but it is long enough now to be below her nose in the front! *sigh* afer today I have a week straight of scheduled hours and then Sunday off - and then another four days on and a Friday off. It doesn't seem like a lot even though a lot of those days on end at 3:00 in the afternoon. Elizabeth's trade package arrived today and it is great fabric :) But, I'm uninspired as to what to make today. It figures, I finally get a few days off (and no more for two weeks) and I'm at a loss for what to do. Esme has been a brat today - really wants to go see Grandma but she is in Memphis. We got a Playmobil toy in the mail today as well - and she loves the little dog figures and opening and shutting the house. But most of the day she has just run around and screamed or gotten into things. She 'helped' me cut a few quilt squares for an ongoing project and ate her lunch well, but then it was all about trying to get the needle on the sewing machine (which was off) and trying to reach my scissors up on the shelf. She knows what comes next and wants to help - and gets mad when she can't. She also has not taken a nap all day -- which I think she is due for. Any suggestions for projects? I looked on Etsy some and on other places on the Internet and didn't get any good ideas. We've taken Esme down to the lake swimming twice now - she doesn't like the waterwings at all, but was able to float by herself for a few moments before clinging to us again. About halfway through our last swim the amount of complaining dropped to a minority instead of a majority of the time - which shows improvement. She fell today in the tub and nearly went under the water. That activity means a lot of crying and comforting usually because she gets very scared. However, she just got up, looked around for a second and then grabbed a toy - no scared fit.. I count that as improvement, too. The other day in a magazine I saw a recipe with avocadoes. 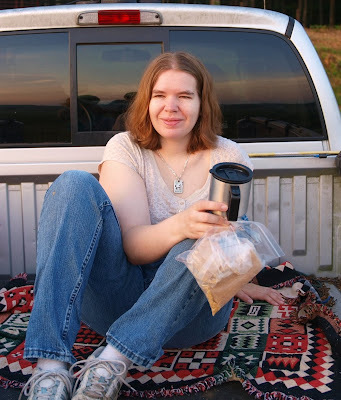 I remembered that in college I once ate a whole container of guacamole in a single sitting (yes I did get sick - but for some reason it was compelling). I haven't tried it again since then and wanted to. I bought an avocado after work and it was very good mashed up with tomatoes and lime! I gave Esme a tiny bit of the mashed avocado on a piece of bread and she said it was good - but because it was green she didn't want to touch it without it being on the bread. Silly kid - it's almost as if her Daddy has taught her anything green isn't food :) That is pretty close to his philosophy. Esme seeing the sunrise and saying what's dat? 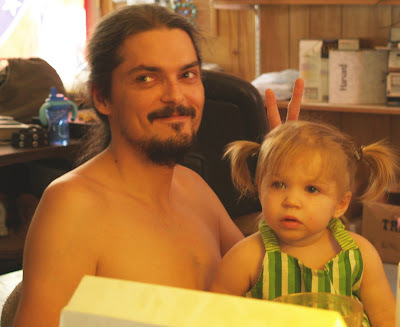 Wow, Father's Day and Summer Solstice today, that only happens once how many years? And because it is Solstice, it is also my birthday. That makes Thirty. Yipe. This is how we celebrated. 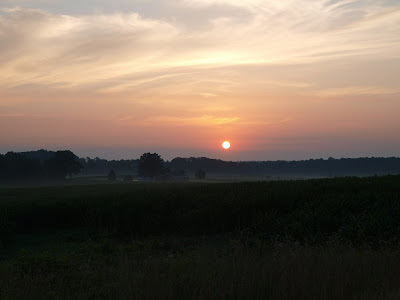 The sun rose between 5:35 and 5:45 am. We got everything set the night before and Mark knew just the place to go to get a good view. Mark doesn't have any big plans today, reading a book - maybe going out to lunch. little Esme update: Esme is surprising me more and more every day with her letters interest. She came up to my computer and pointed out the M in the IBM. 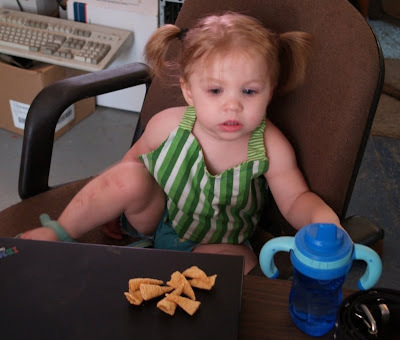 We went to Starfall.com and she can navigate some of the functions herself! 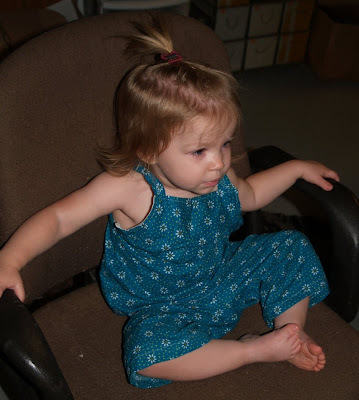 I didn't know that but she did - she has been taking my hands off of the keyboard and moving the mouse all by herself. We are working now on learning some of the keys which will really help her letter recognition even more. She already can find the M key even though it isn't labelled -- haha she likes that and the letter E so much. We're working on finding the 'right arrow' key since that advances pages in Starfall. She's doing remarkably well for someone less than three feet high and two years old! Our Iggy is growing up. 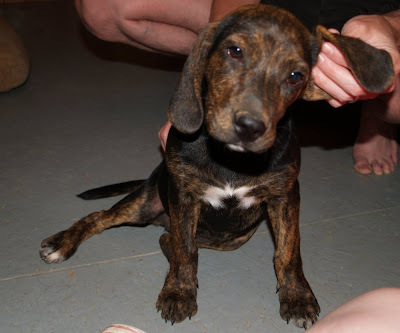 You can see so much more hound in her now. Mark built a little robot kit. Esme is getting a kick out of watching it run around the floor and trying to pick it up. This is the outfit I wanted rick rack on, but it looks pretty good without it. It is the one yard of fabric I bought from the Quilting Bee. I think it really picks up the color of her eyes, although that isn't visible in this picture as she was intently watching Big Bird sing the alphabet on the DVD we rented. I was just noticing the book 1632 again on Carrie K's site - and asked Mark if he had read it. He said he couldn't find a copy. But guess what? Today we were at the library sale and lo and behold there was a copy on the shelf for sale! He's reading it right now. I'm pretty upset at the Camden, TN WalMart's craft section. They no longer carry fabric. I couldn't even buy a roll of rick-rack there. Scrapbooking and 'holiday celebrations' have taken over. Very bad. I don't think I have a reason to even go there anymore now. Paris, TN is closer - and they still have some fabric. The selection is not very good though - mostly flannels and character stuff, very few new items coming and going. Their prices have gone up by 50 cents and a dollar a yard just in the past few months. There are rumors they are going to do away with the fabric too - which is bad news all around. There is a new fabric store called the Quilting Bee in Camden - with a small selection of designer collections. I don't often see anything I want to buy in there - and it is such a long drive to go take a look. I might have to end up buying fabric entirely online or wait months to go to Jackson, TN. Jackson has a Hancock fabric store as well as a Hobby Lobby. I usually find something I want at one or the other - and it is nice to actually be able to touch the fabric and match it up to something else to coordinate with. Jackson is an hour's drive away from here though - and it isn't somewhere I go often. This area really needs a better craft store. I'm not the person to open one up right now though. Esme takes her moments when she has to point out letters and ask what they are. One of her favorite places to do this is Grandma and Grandpa's tv when CNN is on. She also points out lettering on packaging, although she doesn't always say the right ones for what she is looking at. However, today in the store I wasn't expecting her to be in letter mode when we were looking at a pair of shoes. She was looking up over my head and pointing up saying 'what's that?' The sign said 'kids' above us in big letters. After I read it out to her 'oh that? the sign? k i d s - it says kids' she was happy and started reading the tags on the shoes. Some of Esme's new words: chicken, shake, yucky, seat, sweep, 'we go town? ', hey! (somebody's barking/growling/being loud), plate, 'pretty girl', 'good girl' - others will have to think of them later. Tried to have a few nights without the pacifier, because the one she had was gross. The first night worked fine, I think because I showed her it was yucky and threw it away. The second night though her tummy hurt her and she knew I had to be up early the next day (she can feel the anxiety in me, I swear, and reacts to it). She screamed until 1 am and I gave in and dug one out of the drawers in the kitchen, washed it - and popped it in her mouth. She fell right to sleep. Argh. 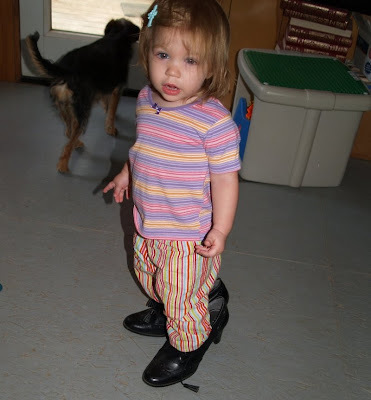 That morning (before 5 am) I was putting her shoes on her after Mark had got her up and dressed. She looked at me and said 'we go to town?' Haha - she's got it down. Yes, we go to town -- after that she was all about going outside, down the steps and to the truck so she could go to town. 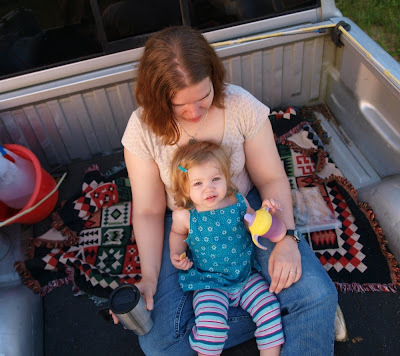 She can get up and down from her carseat in the truck but we need to do and undo the belts for her. She also smacks her lips in the back seat when we are in town to try to get us to get her a shake at Sonic. 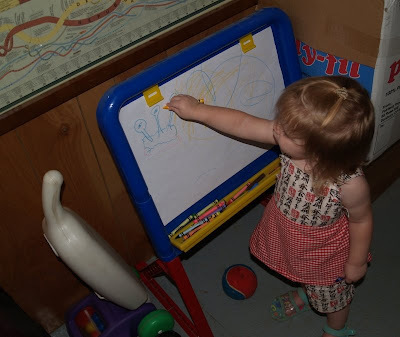 The other day she colored on a white storage table we have in the house. I told her it was yucky and would need to be washed now, 'wash wash rub rub'. That is my idiom that always follows anything I am cleaning. She walked past us to the diaper change station, opened up the diaper wipes, took one, closed the box and came over to rub the crayon off the table. It didn't work actually ( I used some 409) but wow that little brain is working all on it's own now, and 60 per at that. Mark and I were both impressed with that. She's also turning on both faucets in the tub now - not really good! For a while she has been able to answer 'what do doggies say?' and 'what do kitties say?' - last night she answered 'what do dinosaurs say?' RAAAAR!! and 'what do giraffes say?' (brrrrrrrrrrp) that's a long story hehe but in our house giraffes say 'brrrrrrrrrrr' like an old fashioned telephone ring. Also little girls do not eat peanut butter sandwiches, but little girls pretending to be dinosaurs will eat a few bites. 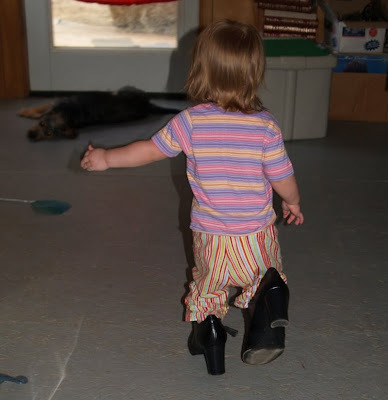 Esme found my high heels today. I don't wear them very often but she has told me they are my 'pretty' shoes. I think that's funny as most other things she calls pretty are brightly colored and these are black! She got into them by herself and I followed her around the room sure she was going to fall! She didn't appreciate the flash on the camera ;) I think she walks in the shoes almost better than I do! 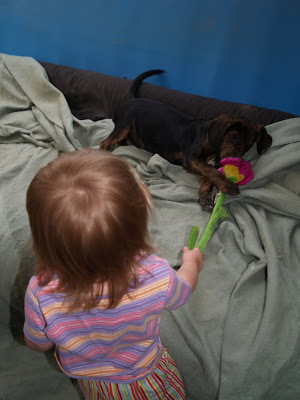 Playing tug of war with the doggie's flower toy. I'm still puttering along trying to make something every couple of days. 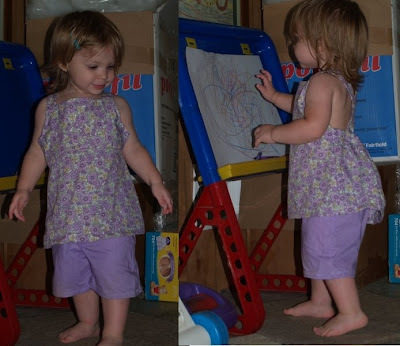 Those sundresses are so easy and so cute. 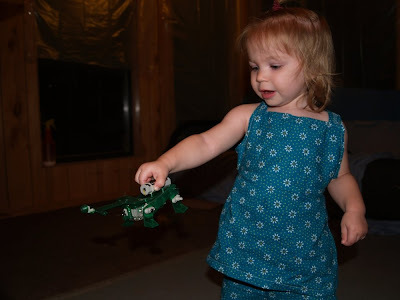 I had felt it was kind of a splurge for the pattern and fabric the other day - but it is definitely more than worth it, especially considering the prices of toddler clothing! I have some asian lettered fabric in white and red, and some red checked gingham cut out ready to make the next sundress and shorts out of. My job is full time now and that just doesn't leave a whole lot of leisure time. I am the 'plumbing specialist' - the person who helps people plan the look of their remodelling job, helps them find the right fixtures out of the 10s of thousands available for their price, function, color, delivery timeline etc... and then advises them what they need to hook those fixtures up in their current house. It is a lot different than mixing paint, and there is a lot to learn, more people skills needed and a lot of notekeeping, calling companies with questions about products, calling customers back etc etc... The pay is better but you have to meet monthly quotas on several categories. If you meet your quotas you also get bonuses, if you don't meet your quotas for many months in a row --- well that depends on the situation but it usually isn't good... *crosses fingers* I got my bonus for last month, yay! I've known it's coming - for many kids it is one of their first words - not their fiftieth.... The Word No. She already has 'uh uh uh' which means don't do something and also with the word 'bad' towards the dog and the cat. Today the cat was on the table and I had told it to get down - bad kitty no table get down. She held up one thin little finger and said 'No kitty bad' It was only a matter of time. Now to see how she incorporates it into everything else in the next few days.